A weaker American presence would only compound New Delhi’s existing Afghan conundrum. Last week, U.S. President Donald Trump decided to pull out about 7,000 American troops from Afghanistan. The decision to slash the number of troops by half appears to have been taken by Trump against the advice of his own senior administration officials, and this has provoked varied reactions in the region and in the United States. For India, however, there is little question that this surprising decision puts it in a tough position of having to manage any potential fallout while having few viable policy options to deal with the emerging situation in Afghanistan. It is no surprise that commentators in New Delhi have almost uniformly expressed concerns about the consequences of the decision for India. India’s policy has been to suggest an “Afghan-led, Afghan-owned and Afghan-controlled,” process with participation of the Afghan government. The gist of this appears to be that India wants to leave Pakistan out of the process. But it has become increasingly concerned about the central role that all key players are giving to Pakistan. In reality, most of the other stakeholders have simply ignored India’s views and have been engaged in finding a solution with the inclusion of Taliban and its sponsors in Pakistan. Oddly enough, Pakistan’s Foreign Minister Shah Mehmood Qureshi, for the first time acknowledged that India has a stake in Afghanistan and that Indian cooperation is necessary for the peace process in the country. A clear effect of India’s stand has been to isolate India in the multiple ongoing negotiations for ending the war. As an editorial in an Indian newspaper, The Hindustan Times, noted, “the American withdrawal comes at a time when its [India] views on Afghanistan are at a significant variance with other traditional regional partners like Russia and Iran.” In fact, the U.S. Special Representative for Afghanistan Reconciliation, Zalmay Khalilzad, had twice skipped New Delhi when he had visited the region to hold talks on Afghan reconciliation. Even India’s long-standing ally, Russia, has ignored India’s objections to negotiating with the Taliban, and invited the Taliban to the second round of talks in Moscow in early November (India swallowed its pride and did send two former foreign service officials to the Moscow talks). Of course, India has not been entirely forgotten in the Afghanistan conversation. For instance, India can take some comfort from the fact that Ambassador Khalilzad will be stopping over in India over his next swing through the region in January, while the Russian Special Envoy, Zamir Kabulob, also visited New Delhi last week for bilateral India-Russia discussions on Afghanistan. Nonetheless, all in all, it is clear that despite the fact that India has contributed a huge amount of economic assistance to Afghanistan and the supposed-support for India among the Afghan masses, New Delhi has found itself without much viable options in discussions about the future of Afghanistan. There is little doubt that New Delhi is becoming increasingly anxious about the state of the Afghan peace process and particularly about Trump’s sudden decision to withdraw forces. But at the same time, India also finds itself without very many good options about how to proceed. 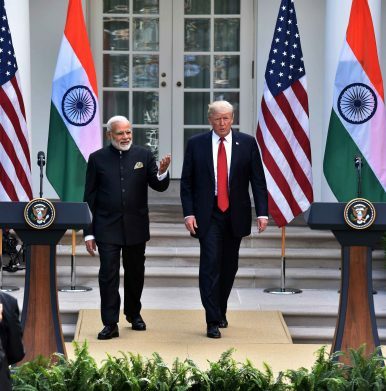 If the United States does go ahead with a significant withdrawal of forces from Afghanistan, India’s troubles will undoubtedly deepen. Lockheed Martin is reportedly offering Tokyo top secret software as part of its pitch to develop Japan’s next-generation stealth fighter.